"Teemu Viinikainen (b. 1975) is one of the top 20 jazz guitarists in the world", says internationally renowned professor, author and critic, Stuart Nicholson. As a supreme instrumentalist and soulful interpreter, the well-known virtuoso from Helsinki has, over the years, played in a number of top groups. Among others, the ensembles of Jukka Perko, Eero Koivistoinen and Jukkis Uotila have assisted in Viinikainen becoming well known by jazz audiences. Within their ranks, he has risen to become a world-class guitarist. This is evidenced by his cooperation with such major overseas artists as Joe Lovano, Tim Hagans and Randy Brecker. Viinikainen has also enjoyed wide acclaim in his home country of Finland and has received, for example, the Finnish Jazz Federation’s Yrjö award and a Sony Jazz Award. In addition, he has also twice been nominated for a Teosto award for his recordings with the Perko-Pyysalo-Viinikainen trio. The most important group at the start of his career was the U-Street All Stars, which rose in popularity during the early 2000s after a victory in Spain’s Getxo jazz group competition. The band also recorded two full-length albums on the prestigious Blue Note label. Viinikainen’s first solo album, Tales of Robert Dickson, was released in 2005 and was followed up in 2012 with a new release entitled Nyt! on which he was accompanied by bassist, Ville Herrala, and drummer, Mika Kallio. The second album by Teemu Viinikainen Trio, Hit It!, came out early in 2014. Viinikainen holds a master's degree in music from the jazz department of the Sibelius Academy, where he has also worked as a teacher since 2002. 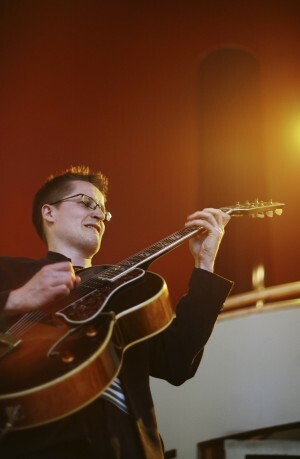 His prowess on the pedagogical side can be seen in his recently published jazz guitar textbook Rytmi elää (The Rhythm Lives).